A Few Paragraphs: Jupiter takes one for the Gipper! Jupiter takes one for the Gipper! You may have heard about the planet Jupiter's altruistic ways, how it protects the Earth from gigantic planet-killing rocks by flinging them back out of the solar system, using its mighty, mighty gravity. Actually there's some debate about this. Spoil sport astronomers (the same ones that demoted Pluto from being a planet no doubt. Jerks!) like to point out that, while Jupiter does a good job of catching asteroids rocketing in from the depths of space, it also has this habit of bumping into friendly, stable rocks already here, sending them in our direction. But, however that may be, our planetary big-brother did take a bullet for us the other day. 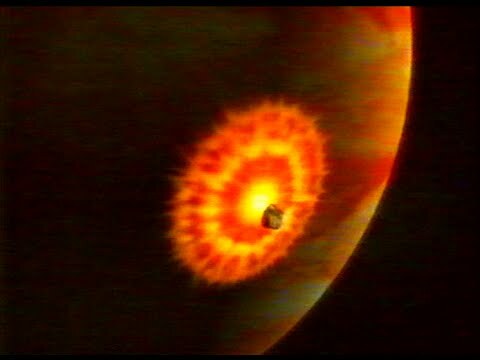 While the ever-ready amateur astronomers accidentally watched on March 17th, something smashed into Jupiter and blew up!